TV news anchors are the people who present the news at the various television stations and networks. You know these people—the ones sitting behind a desk or out on the beat telling you what happened in the world that day. 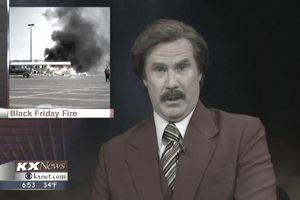 Whether broadcasting from a small local station or manning one of the broadcast network’s primetime news shows, TV news anchors compile news stories and deliver them. Being a news anchor requires a number of skills, the first of which is a comfort level in front of the camera. An element of show business comes with the job of a news anchor—not only do you need to be comfortable in front of the camera, but you need to connect with the audience so that people want to watch you as opposed to your competition. Feeling comfortable speaking to the camera is not a skill most people are born with, but you can acquire and hone it. Excellent verbal, written, improvisational, and interviewing skills are imperative. Add to those qualities persistence and objectivity, physical stamina, being a team player, projecting a professional image, and having a knowledge of social media. News anchors also need to be able to think on their feet. While many anchors read scripts off of a teleprompter or notes on their desk, information can also be transmitted aurally. If news is breaking, a producer may feed the information to an anchor on the spur of the moment. The anchor needs to be able to absorb the information that's coming in and then relay that information to the audience in a clear and concise manner. While news anchor jobs come with a lot of visibility and fame, the position also comes with long hours, hard work, constant deadlines, and unpredictable natural and world events. These range from political scandals to school shootings to terrorist attacks. Anchors need a stomach for negative stories and the ability to remain objective and unemotional in the face of disaster. Television news anchors must have a bachelor's degree in broadcast journalism or communications, relevant internship experience, and work experience in smaller cities. Learning the craft in small markets provides necessary training if a broadcast journalist wants to work their way up and become successful. While not required for employment, completing a master's degree program provides students with additional training in the field. Master's degrees are available in broadcast journalism and communications. Candidates with graduate degrees typically have a competitive advantage when seeking job opportunities or advancements. Salaries vary greatly depending on whether or not you work in local news (in a smaller town like Poughkeepsie or a bigger market like Chicago) or if you're a network anchor. For example, according to the U.S. Bureau of Statistics, a news anchor at a Phoenix TV station earns between $30,000 and $35,000. For those who make it to the big leagues (like ABC, NBC, CBS, etc. ), salaries can range from $18 million to $37 a million a year—the salary of former Fox News anchor Bill O'Reilly, who reportedly was the highest-paid TV news personality before leaving Fox in 2017. The amount of reporting involved in an anchor’s job depends on where the anchor works and what type of broadcast they work on. Some anchors, especially at local news stations, report their own stories, perhaps with the help of producers. That's because budgets are tight and many local stations keep a slim staff. Local anchors may also write their own stories, in which case they are functioning more like reporters. The general newscast delivered from behind a desk is usually not written by the network anchor but rather a staff of writers who work for the show. The well-known exception to this rule was the hard-hitting Dan Rather, who also served as the executive producer of his nightly newscasts on CBS-TV. Aspiring anchors need to spend time in front of the camera. Most people get jobs because they have a tape of their work on-air. Before you look for a job as an anchor, complete an internship at a local station (if it affords you some air time), or study communications in college. American journalism schools have both undergraduate and graduate degree programs. At school, you can at least create a sample tape to send to TV stations. Once you have a tape, start looking for jobs at local stations. There are also myriad opportunities on-air at various cable news channels.